Last week was a banner week for cooking in my household. I hate wasting food, so I wanted to cook up as much vegetable-y goodness as I could from my Fresh Fork Market bounty. And so I made beets. I'm not the biggest fan of beets, honestly. To me, they taste like dirt. No matter how I cook them. No matter what they're paired with or slathered with. 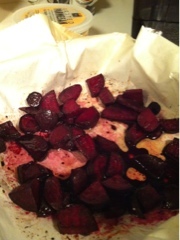 But I can honestly say the recipe I followed from Post Punk Kitchen to make Caramelized Beets wasn't half bad. So...I was cooking 4 things at once when I made this recipe, and I totally missed the step where is said to peel the beets. Oops. But I don't think that really hurt anything. Probably added to the earthy flavor, if anything. I also didn't have 2 pounds (I had one small bunch) so I overdid it with the vinegar. Not sure if that was a good or a bad thing since the vinegar seemed to tone down the dirt flavor. Overall, this wasn't a bad recipe. I'm going to keep getting beets from my CSA all summer, so I'd better figure out some other ways to cook them up!